Culture Club are an English band that were formed in 1981. The band comprised Boy George (lead vocals), Mikey Craig (bass guitar), Roy Hay (guitar and keyboards) and Jon Moss (drums and percussion). In the UK they had twelve Top 40 hit singles between, including the number ones “Do You Really Want To Hurt Me” and “Karma Chameleon”. Ten of their songs reached the US Top 40. After occasional singing with the group Bow Wow Wow George decided to start his own band and enlisted bassist Mikey Craig, drummer Jon Moss, and guitarist Roy Hay. 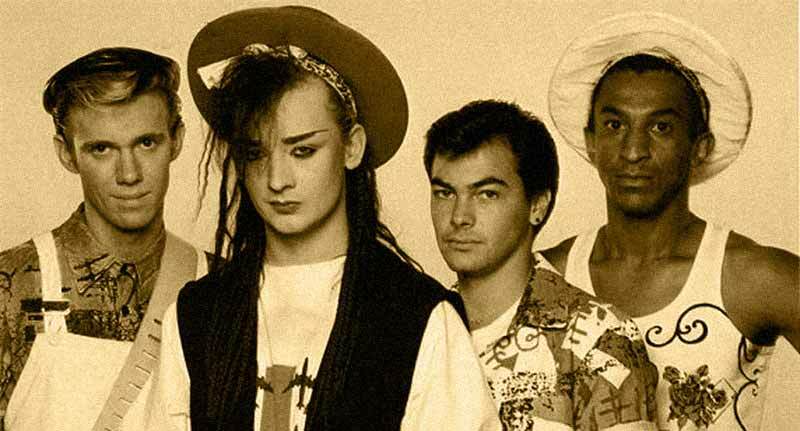 Realising they had an Irish transvestite as the lead singer, a black Briton on bass, an Anglo-Saxon on guitar and keyboards, and a Jewish drummer, they eventually decided to call themselves Culture Club. The Culture Club’s two singles, “White Boy” and “I’m Afraid of Me”, failed to chart but in September of that year, the group released their third single, “Do You Really Want to Hurt Me”, which became one of their biggest hits. The song went to No. 1 in the UK and peaked at No. 1 in over a dozen countries (No. 2 in the US). The band’s album, Kissing to Be Clever was released in October 1982, and the follow-up single, “Time (Clock of the Heart)”, became another Top 10 hit in the US and UK. “I’ll Tumble 4 Ya” also became a Top Ten hit in the US and in Canada. This gave Culture Club the distinction of being the first group since The Beatles to have three Top Ten hits in America from a debut album. The band’s second album, Colour by Numbers was released in 1983. The first single “Church of the Poison Mind”, reached the UK and US Top 10. The “Karma Chameleon” single gave the band their biggest hit, peaking at No. 1 in the UK , where it became the best selling single of 1983 and has sold 1.5 million copies there to date. It also peaked at No. 1 in the US, and would ultimately hit No. 1 in 30 countries, thus becoming one of the top twenty best-selling singles of the 1980s. The album Colour by Numbers would spawn more hits including “Miss Me Blind”, “It’s a Miracle” and “Victims”, and sold four million copies in the US and another five million worldwide at its time of release. The album gave Culture Club the distinction of being the first group in music history to have an album certified diamond in Canada. The band also won the 1984 Brit Award for Best Group and the Grammy Award for Best New Artist. In 1984, the group released their third album, “Waking Up with the House on Fire”. Although Platinum in both the UK and the US, it was a commercial and critical disappointment compared to their first two albums. The album contained the hit single “The War Song”, which reached number 2 in the UK, and Top 20 in the US. Other singles like “Mistake No. 3” (US No. 33) and “The Medal Song” (UK No. 32) would become modest hits. George and Jon Moss also no longer wanted to be around each other due to constant relationship battles and, coupled with George’s drug addiction, a forthcoming American tour had to be cancelled.The band broke up and George pursued a solo career, having several European hits and a couple of US Top 40 hits.The band first tried to reunite in 1989, after many requests from Tony Gordon, the group’s former manager and Boy George’s manager at that time. In 1998, Boy George and Jon Moss put their differences aside and the band reunited to do a reunion tour, kicking off with a performance on VH1 Storytellers. In 2006, two original members of Culture Club (Craig and Moss), tried to launch a new tour with another lead singer, as Boy George and Roy Hay had declined to tour.